I’m something of a rereader. There are plenty of books sitting on my shelves that I’ve easily read 5+ times, and would happily read another ten times. Some books I know so well that I can practically recite them, and their stories and characters have left an indelible mark of who I am as a reader, a writer and as a person. 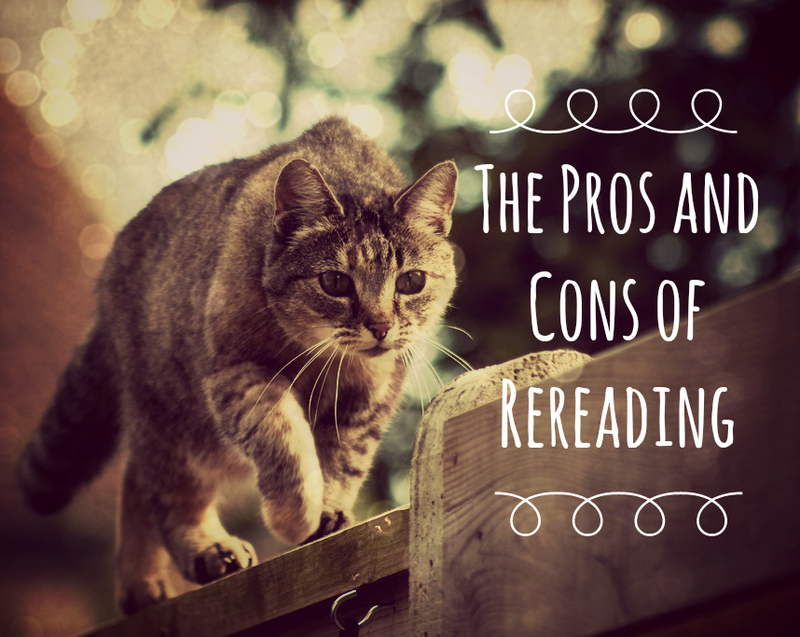 I’m pretty much 100% sold on rereading, but I know there’s plenty of readers out there who aren’t as into it as I am, so here’s a (not at all biased) list of pros and cons of rereading. You can pick up on details you missed the first time. Whether it’s a crafty bit of foreshadowing, an important clue that you didn’t see the significance of the first time around or some amazing world-building that you missed the first time around because you were trying to work out what was going on, stories often have layers that reward a second read. Rereading can give you an understanding of the characters and their development than a first read will allow. I still remember the first time I read Pride and Prejudice, I didn’t really like Mr Darcy all that much. He seemed okay, but certainly not worth all the fuss that seemed to surround his character. But the second time around, not only did I pick up on more of the depth of his character, I was also able to pick up on Jane Austen’s oh-so clever sense of humour and the satire. Even books with the killer plot-twists are rewarding to reread the second time around. It’s rare that a good author will have a plot-twist without some kind of hints beforehand, even if it’s as subtle as word choice. Rereading can give you more of an insight into the subtle nuances of a story that only familiarity with the story can allow. You can really get your money’s worth. Books are expensive, and if you’re paying money for something, it’s nice to think that you’ll be using it on more than one occasion. Obviously when you buy a book it’s pretty tricky to know whether you’re going to want to read it again, and there are plenty of books I’ve bought that I never-never-never want to read again, but I always feel like if I can get a couple of rereads out of a book, I’ve spent my money wisely. Reliving the story’s still pretty great the second/third/tenth time around. You think you fell in love with the characters the first time around? Probably my favourite thing about rereading is being able to fall in love with my favourite characters all over again. Maybe some of the suspense is gone, but if the book’s good enough, you’ll still be carried away by the story nonetheless. The adventures don’t have to ever truly end. Rereading a childhood favourite can take you back in time. I know some people say that when they reread a book that they first read on holidays that it takes them back to that time, but I’ve always experienced this sensation more strongly with books I read when I was younger. Whenever I pick up The Fire Within by Chris d’Lacey, I feel like I’m ten years old again, believing in dragons and wishing I could be Lucy Pennykettle. Lemony Snicket’s books take me back to being in grade two and the primary school library and discovering Violet, Klaus and Sunny for the first time. It’s a way of recapturing memories and sensations that until you pick the book up, you might have forgotten. It’s as simple as going to your bookshelf. Maybe you’re a little strapped for cash, and can’t really afford to buy any new books, and you don’t have time to go to the library. Or perhaps your library just doesn’t have a very good range of books (up until recently, this was my problem). Rereading is an easier, cheaper way to read books, and you never have to worry about returning them late. Some books become like a comforting friend. For a long time, Scott Westerfeld’s Leviathan trilogy was my during-exams read, and it’s still one I go to when I’m feeling stressed. There are a number of books I have on my shelf that I know I can go to when I’m not feeling so great, and that comes from a mixture of the right story, and a sense of familiarity with the plot. It’s never quite the same as the first time around. There’s a lot of books that I wish I could read again for the first time. Finishing the Skulduggery Pleasant books last year was devastating for me, having spent most of my teen years reading these books, and knowing I’d never read one for the first time again. There’s a certain magic to plunging into a book with all that uncertainty as to what is going to happen, and nothing can quite replicate it. Plot twists aren’t so twisty any more. When you know what’s coming, what was initially a shock doesn’t have quite the same effect. Personally, I don’t mind this, because I like seeing how the author leads up to the plot twist, but you do lose the “what what WHAT” effect that an unexpected development can have. You might miss out on a whole range of books if you only reread the same ones. This is only really true if you’re rereading books instead of reading new ones. Sometimes it’s just impossible to get your hands on something new, but sometimes I do wonder how many books I’m missing out on when I reread my old ones instead of going to the library to find something new. I think it’s important that you have a balanced diet of new and old reads. So what are your thoughts on rereading? Are you an avid rereader like me, or do you prefer to only read books the once? Any pros and cons I’ve missed? Let me know in the comments!